Welcome to another installment of If My Book, the Monkeybicycle feature in which authors shed light on their recently released books by comparing them to weird things. 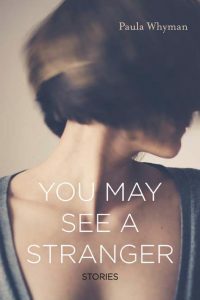 This week Paula Whyman writes about her debut story collection, You May See a Stranger, out now from TriQuarterly Books. . If You May See a Stranger had detention with the weird kid at school, it would be with the girl whose arm hair was long enough that she could tie it in knots by twirling it between her fingers. Oh, and why would YMSAS get detention? For “sass,” of course. If You May See a Stranger were on a summer trip to Italy, it would stay in a hostel too close to the train station in a town that looked good online but turned out to be the industrial center for ceramic tile manufacturing. The clerk at the front desk would be moody because of the heat, there would be no screens on the windows, and the mosquitoes would be voracious. But there would be two backpackers from Sweden staying down the hall, so the trip would be totally redeemed. If You May See a Stranger were a marine mammal, it would be a dolphin, because you can’t tell whether they’re amused or not. But they probably are, secretly. If You May See a Stranger were a well-known historic site in Washington, DC, it would be Union Station before it was all polished up and remade as a tourist destination. If it were an obscure memorial in DC, it would be the statue of Albert Einstein. People would stop by in order to sit in its lap. If You May See a Stranger were a Bond it would be Connery. I mean, come on. If You May See a Stranger were a sport, it would be roller skating at the big indoor rink in the suburbs, the place that’s now a grocery store, the time your friend met the guy in the Bruce Lee T-shirt and spent the rest of the night skating with him, and you didn’t think he was all that. If You May See a Stranger had a TV boyfriend, it would be Bill Bixby in his Courtship of Eddie’s Father days. You May See a Stranger would break up with him before his The Incredible Hulk days, because it prefers an even-tempered companion to counter its own moodiness. If You May See a Stranger were a person in your neighborhood, it would be Fred, the mailman who always examines your mail as he slips it into your box. If he sees you around, he’ll drop hints about the letters you received—too many bills, some good coupons, another missive from that woman in Portland. He knows too much. He means well. If You May See a Stranger were the best birthday party when you were a kid, it would be the one where everyone dressed as pirates and went on a scavenger hunt through all the neighbors’ backyards, and no one got angry about you climbing their fences and taking stuff they didn’t need, like the broken sprinkler and the whiffle ball and a cutting from the forsythia, except the one guy with the riding mower, and no one could help what happened with that. If You May See a Stranger were a cup of coffee, it would be sitting on your desk getting cold, and you’d drink it anyway, all of it. Paula Whyman is the author of the linked story collection You May See a Stranger (TriQuarterly Books/Northwestern University Press, May 2016). Her fiction has appeared in many journals, including Ploughshares, VQR, and McSweeney’s Quarterly. A music theater piece, “Transfigured Night,” based on one of Paula’s stories, is in development with composer Scott Wheeler. Paula is a fellow of The MacDowell Colony and Yaddo. A native of Washington, DC, she now lives in Maryland. Find out more at paulawhyman.com. Follow her on Twitter at @paulawhyman, and on Facebook.